LV BET is based in Malta and was established in 2015. We have tested LV BET. We started by taking a closer look at the casino section. There is a section called LV-LOVES where you can find the most popular and trending games being played by LV-players. Among the games we found in this section were Stunning HOT, Bonanza, Book of Dead, Starburst, Fire Joker, Reactoonz and the great NetEnt game Gonzo’s Quest. The other part of the casino section that we inspected where new games. We found Strolling Staxx, Who wants to be a Millionaire, Vikings, Turn Your Fortune and Rocket Fellas Inc. We recently saw the tv-show Who wants to be a Millionaire so, we decided to take a closer look at the game with the same name available at LV BET. We think the idea is brilliant but we got slightly disappointed. We were looking forward to answering some questions when we finally reached the Bonus mode by receiving 3 “Who wants to be a Millionaire TV-show logo symbols”, which triggers the Bonus mode. It was really exciting to sit down on the hot seat and suddenly see the 4 alternatives (A,B,C,D) on the screen. The sound was exactly like in the tv show and the pulse a little bit faster than normal. If you answer the twelve questions, you can win up to 50 freespins. Like in the tv-show, you move upwards on a “ladder” if you choose the correct letter and you can also use lifelines like 50/50. Wrong answer can lead to a loss of freespins. It’s a pity that there is no real questions, you have to guess the correct letter but the nice graphics and similarities to the tv show makes the game really entertaining. You have to try it! In the jackpot section we found 17 different games. Among the jackpot games are Mega Moolah, Mega Moolah Isis, Divine Fortune, Super Lucky Frog, Cosmic Fortune, and Kings Treasure. The jackpot section is decent but we didn’t find Mega Fortune or Mega Fortune Dreams, it is 2 NetEnt games that we like to see in the Jackpot section. You can enjoy a Live Casino at LV BET with games from Evolution Gaming. You can choose between multiple versions of Roulette, Baccarat and Blackjack. Since the developer is Evolution Gaming, you can play the popular live games Lightning Roulette and Dream Catcher. It is also possible to play Video Poker, you will find a couple of poker games in the table games section. A great feature is the Sportsbook section “it covers all the major sports tournaments around the world. From the UEFA Euro Cup to the NBA, Formula 1 to Grand Slam tennis tournaments and even eSports”. “You have the opportunity to bet on hundreds of events with high odds, special bets, milestone bonuses”, and a number of LV BET Sportsbook promotions. The Sportsbook is good and extensive, you can bet on the US Presidential Election 2020! Of course you have to try Virtual sports at LV BET. You can choose between instant racing, instant football, virtual racing, virtual tennis, Greyhounds, Horses, Speedway, Cycling and Trotting. The promotion section is full of different kinds of promotions in writing moment you can win a price to a Whale safari in Norway, imagine to see Humpback whales! At the tournament section you see ongoing and recent tournaments and read more about them. Recently the price was to split a share of 1000 LV Spins for top 25 players and 350 LV Spins to the winner. “Playing any slot in the casino will activate the LV Wheel, which grants you access to exclusive rewards which include LV Points. These points are exchangeable against cash money. Every 100 LV Points exchange into €1. * A minimum of 200 LV Points is required to convert points to money.” LV Wheel is LV BETS own version of the wheel of fortune. 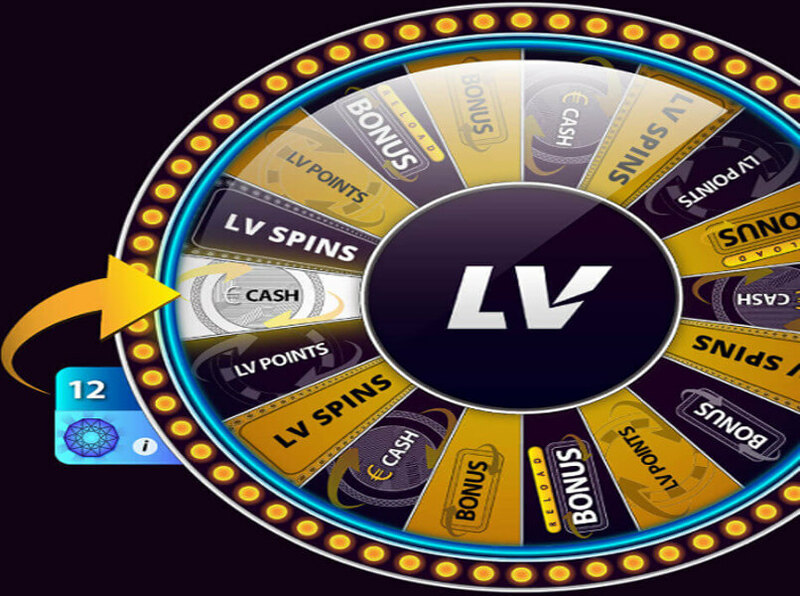 If you want to activate the LV Wheel just play slots and you automatically get a turn on the wheel when you level up.” The higher the level unlocked, the bigger the possible prize.”This feature, is similar to the wheel of Rizk at Rizk Casino. “When you play games you will start to fill the LV Wheel power bar. The more you bet, the quicker it fills up. When the power bar is full, you level-up and the LV Wheel is activated”. LV BET has Virtual Sports, tournaments, LV points, LV-wheel, Live Casino, Sportsbook, Casino and great licensing. Not all casinos have so, many features “under the same roof”. This makes LV BET to a good all-round casino. This is a very good casino that we recommend. Are there any cons? The cons we found where no 24/7 live chat, missing jackpot games Mega Fortune & Mega Fortune Dreams from NetEnt, a second and every next withdrawal the same week costs a fixed fee of 5euro and No Deposit Bonus is not given instantly. These are minor cons except the chat opening time. We think it’s really good when chat is available 24/7. If you are playing late at night try Nightrush Casino, the live chat is open 24/7. The Welcome bonus package is very nice at LV BET. You will also get a 5€ No Deposit Bonus if you are from Austria, Finland, Germany, Iceland, Luxembourg, Norway, Russia, Hungary, or the United Kingdom. There is LV poins., LV Wheel and 5 super levels. A very safe casino with UKGC and MGA license. Austria, Finland, Germany, Iceland, Luxembourg, Norway, Russia, Hungary, and the United Kingdom. Get €5 free bonus, just by sending an email with “€5” subject line. Click on the register button, validate your account, send an email to bonus@lvbet.com – the bonus department will credit your bonus in maximum 24 hours! Try and enjoy the best games including Greentube, NetEnt and Play’n GO games for free! The minimum deposit to qualify for each 4 deposits of the Welcome Package is €10. Sign up and have fun!